Brighter Choice Community School sits at the corner of Hart Street and Marcus Garvey Boulevard, at the northeastern end of Bedford-Stuyvesant. This part of Bed-Stuy isn’t known for sprawling blocks of brownstones or for Spike Lee movies. Tenements anchor each block here, houses peppered sporadically between the large buildings making them easy to miss as you drive through. Roosevelt Houses, Sumner Houses, the projects make it difficult for gentrification to get a stronghold here, and yet fitting in perfectly like the right piece to the puzzle is Brighter Choice. Fabayo McIntosh-Gordon launched the school in 2008. She had a goal to inspire the children of this community, her community. She wanted to start with love. Aside from building an institution that would enrich our children and challenge them to be their very best, she simply wanted to build an environment of love, upliftment, the kind of inspiration that causes those affected by it to jump higher, to reach further. I’ve known Fabayo since we were kids. When she first opened the school, she offered me the chance to run an after-school program. My partner and I created the EGOS program, which stood for Education, Growth, Opportunity and Success. We worked with the 1st– and 2nd-graders. It was an amazing experience of being able to open the eyes of our community’s children to new things. Our end-of-semester project was an exchange project with the children of Masca City, Honduras. We designed T-shirts to send to them. They created small drums to send to us. From the very beginning, Fabayo’s vision for the school was boundless. She was determined to offer the best possible education for the children of this community. 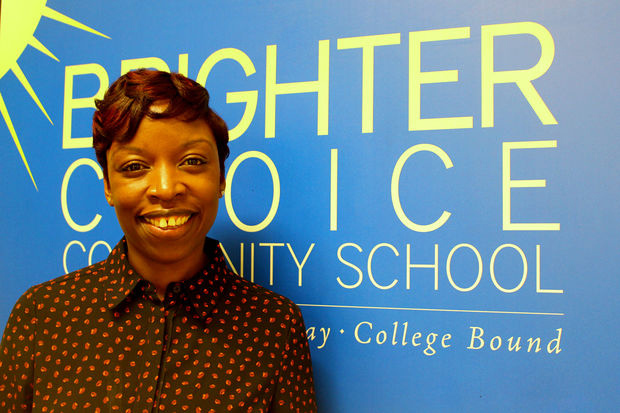 Back in 2008, Brighter Choice replaced a failing school. In a matter of a few short years, the school was regularly posting the best language arts state exam scores in District 16. It became the first school in the district to provide dual Spanish and English language programs. The school’s motto is a resounding one: Every Child, Every Day, College-Bound. The teachers buy in. The parents buy in. The students buy in. The parent community at Brighter Choice is tight-knit, constantly sharing their time and resources to help aid in the vision of the school. One such parent is Earl Silas. Earl has two daughters attending Brighter Choice. For nine weeks, Earl facilitated an anti-bullying and mentoring program in partnership with the 79th Precinct. The program was for the 25 graduating 5th-grade boys. I know Earl. His goal for the children of Brighter Choice is similar to Fabayo’s. Starting from the perspective of love, investing time and resources in our community’s children so that they may be prepared in every way to succeed. And, as far as the parents of the student body go, he isn’t the exception. He is the rule. Recently, Fabayo submitted her letter of resignation, transitioning into another role within the DOE. The DOE has a guideline for leadership transitions that District Superintendents are to follow, it’s called the C-30 Process. Step Five of the Process is to create a Level 1 Interview Committee. That Committee is to include between 4-7 parents of the school. In following the guidelines, the parents requested a meeting with Superintendent Amon-Harris to discuss the very pivotal transition of leadership at Brighter Choice. The meeting was to be held on June 21st, over a calendar month after Fabayo submitted her letter of resignation. Superintendent Amon-Harris agreed to meet. On the 21st, over sixty parents convened in the auditorium to meet with the superintendent. The superintendent, without prior warning, arrived and notified the school that she was not prepared to meet with the parents, virtually leaving the parents hanging, not able to express themselves and not able to be more educated on the process. This past Monday, Earl penned a letter to Superintendent Amon-Harris and the School Chancellor, calling the decision to nix the meeting after having more than a month to prepare for it “not acceptable.” The letter went on to point out several incidents over the past year where the superintendent exhibited “unprofessional” and “embarrassing” behavior. One such incident occurred in May of 2017 at The Brownstone School. Richard Beavers, owner of The House of Art Gallery, who coincidentally also has a child attending Brighter Choice, was contracted by The Brownstone School to facilitate an art presentation and a book-signing with award-winning illustrator Bryan Collier. The event was to take place from 5pm-7pm. At 4:45, Beavers received a phone call from Collier explaining that due to traffic, he would be approximately ten minutes late. When Mr. Beavers explained the situation to Superintendent Amon-Harris, she began berating Beavers, yelling at him in front of children, staff, parents and his own son. Mr. Beavers remained calm and expressed his displeasure at being humiliated, to which Amon-Harris replied, “You work for me!” She then demanded that the auditorium be cleared, moving the children into the cafeteria in an aggressive tone and manner. Other parents who were in attendance verify the story as such. Although Collier arrived at 5:10pm and he and Beavers were eventually able to do the presentation in the cafeteria, Amon-Harris chose not to pay the agreed-upon amount.